Welcome to today's edition of Nerd Alert, where we have all the off-beat, nerdy news for you in one convenient spot. What do we have in store for you on this marvelous Monday? We have a comprehensive video breakdown of all the Easter Eggs in Terminator Genisys, an animated video that shows Sean Connery portraying Gandalf in The Lord of the Rings and The Simpsons gets an Akira mashup. If that wasn't enough, Shia LaBeouf's intense motivational speech even gets the anime treatment. But first, we have the ultimate battle between The Joker and Harley Quinn as they square off against Deadpool and Domino. So, sit back, relax, and check out all that today's Nerd Alert has to offer. The latest episode of Bat In the Sun's series Super Power Beat Down features characters from 2 of next year's highly-anticipated superhero movies, Suicide Squad and Deadpool. 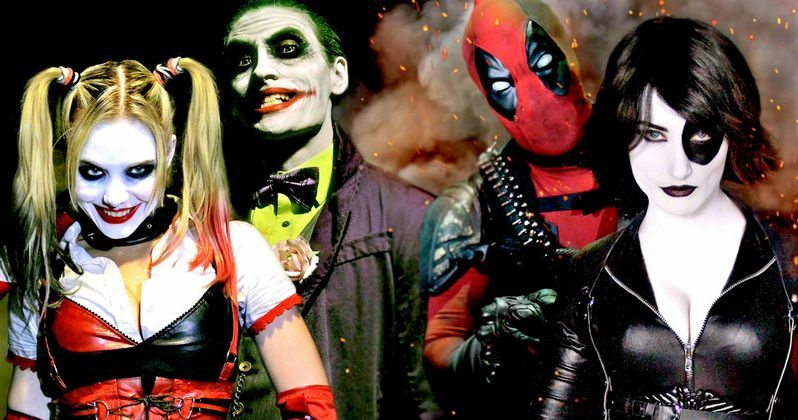 This extensive 16-minute video examines what might happen if The Joker and Harley Quinn from Suicide Squad went up against Deadpool and Domino. Unfortunately, we'll never see this epic fight happen on the big screen, since these characters are all owned by different studios and comic book companies.. But it's still an intriguing battle to ponder. With Terminator Genisys hitting theaters this past week, Mr. Sunday Movies is back to provide a comprehensive rundown of all the Easter Eggs and references to previous movies. And trust me, there are quite a few of them. Along with some of the more obvious references that we've already seen in the trailers, the six-minute video points out a cameo you may have missed, from the former T-1000 himself, Robert Patrick, who appears briefly in a waiting room scene. You may or may not know that, before Peter Jackson hired Ian McKellen to play the wizard Gandalf in Lord of the Rings, the director actually offered the role to Sean Connery, although the actor passed on the role. Mashed offers a humorous three-minute animated video as part of it's What Almost Was series, that shows what some of the franchise's iconic scenes may have looked like, if Sean Connery had taken the role. Bartkira Project has launched an animated trailer for Bartkira, a comic book mashup of The Simpsons And Akira, where Bart Simpson plays Kaneda and Ralph Wiggum plays Akira. The project is a collaboration of over 700 artists and fans of both shows, with Kaitlin Sullivan bringing in 50 of them to create the trailer alone. There have been three volumes of the six comics planned completed so far. It isn't known if there will be more of these animated videos yet. You can visit Bartkira.com to learn more about this project. Just when you thought the wave of Shia LaBeouf's motivational speech mashups had ended, Adult Swim has put together a hilarious video using some of their Toonami shows in what may be the best Shia LaBeouf mashup yet. Adult Swim adds that this video "almost makes up for the Transformers films." Regardless of whether or not you agree with that statement, it's still a funny video. Before Disney secured the rights to John Carter, Paramount was mounting an adaptation of Edgar Rice Burroughs' beloved novel, with Kerry Conran (Sky Captain and the World of Tomorrow) set to direct and Ain't it Cool News founder Harry Knowles set to produce. Last week, Knowles released the presentation reel for this abandoned adaptation, which is quite intriguing and will have fans wondering if this version wouldn't have been the box office failure that Disney's version was. Vimeo user Jacob T. Swinney has created a five-minute supercut of several movies that "break the fourth wall," where characters talk directly to the audience by looking straight into the camera. Films included here are Fight Club, A Clockwork Orange, Ferris Bueller's Day Off and much more. There is some R-rated language in this video, so watch at your own risk. The 4th of July has always meant big business at the movies, with studios taking advantage of the holiday to debut their biggest blockbusters. Houston Twitter feed Bayou City History dug through the local archives to find the movie listings for the 4th of July back in 1985, and as you can see, there were several classics in theaters at the time, such as Back to The Future, The Goonies, St. Elmo's Fire, Cocoon, Fletch, Pale Rider, Red Sonja and Rambo: First Blood Part II.